Perfectly organized and easy-to-reach Christmas ornaments make Holiday decorating easy and enjoyable. I love Christmas and I love decorating for it. Over the past few years, I've learned that keeping my hundreds of Christmas ornaments organized makes Holiday decorating more enjoyable. It also makes it lots faster. While I do enjoy looking at each ornament and remembering why I have it, there are times when I just don't have that luxury. I have Christmas ornaments that have been in my family for generations. They are given special places in my decorating scheme, so I always store them together. Then there are my crystal ornaments, my personalized ornaments, and lots of other specific types of Xmas ornaments. So I store them together and label the storage unit. That way I bring down just what I want to work on that day. So if I've only got an hour or two, I can still get some Christmas decorating done! You can store up to 75 ornaments in the festive red container to the right. 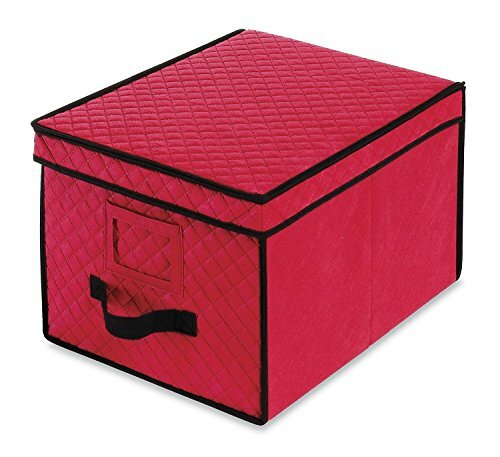 It measures 15.7 inches square and 13 inches tall, so it's very good at storing a lot in a small space. The top zippers for secure closure and easy opening. Imagine how good you'll feel after you've worked so hard at finding the perfect Christmas tree, when it's so easy to find everything you need to decorate it. All of your favorite Xmas ornaments will be safely at your finger tips. You can use the different layers to group your ornaments by color or theme if that's important to you. I have a lot of Santa ornaments that I like to put many places in addition to the Christmas tree. So I can actually fill one up with Santa ornaments. Zip Top is Very Convenient! See Through Boxes can be Time Savers! The first thing that I really liked about this Christmas ornament storage box is that it has a nice place right in front for you to label it. That's so important with ornaments because you have so many. So I can easily label it as teddy bear ornaments and know what I'm going to find in the box without opening it - a giant time saver during the busy holidays. If you have fragile ornaments, you'll love that heavy cardboard separates each ornament. For added protection the divider between levels is quilted. 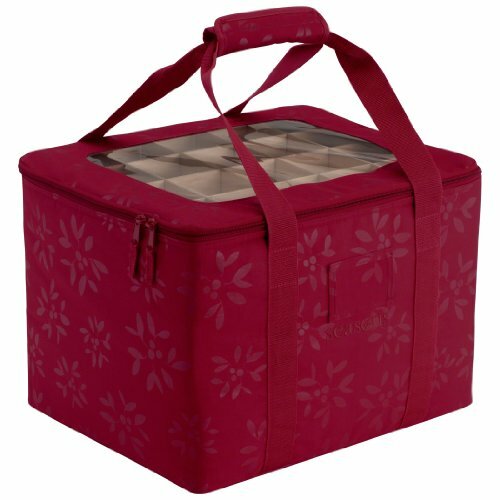 The individual compartments are big enough to fit the largest ornaments. So if you've got small and sturdy ornaments you can put several in one. This is really handy when I want to dedicate say an entire tabletop tree to teddy bears. I can have it up in 20 minutes. 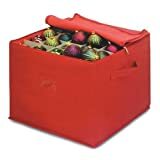 Holiday Storage Ornament Chest Size: 25" x 13" x 11"
This is a very attractive ornament organizer. Don't you just love the snowflake pattern. Is that really important. Well when everyone is over at our house helping us decorate the large Christmas tree in the living room and smaller Xmas trees throughout the house, I like to look pulled together and organized. I also love the clear top so I can get a hint of what's inside. Although I'm known for taping a description on the top of the storage boxes that have my ornaments in it so I know exactly what I've got in each. A zipper keeps the ornaments in securely. Yes this is very important. I don't want a bag tipping over and spilling out - and possibly - breaking my ornaments. They are both sentimental and expensive. I've got enough that during the times when money is tight, I don't have to worry about decorations. 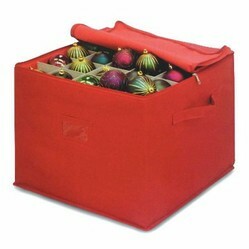 The Christmas Ornament Storage provides good protection for decoration accessories. Hmm. I really wish I'd used these last year! Great idea...maybe next year's decorating won't be quite so chaotic. You easily put your Christmas tree away, store it out of sight and then put it up again, without any hassles with these Xmas tree storage bags and boxes. We've all got those favorite ornaments that we try to put at the front of the Christmas Tree so everyone can see them. You can also use an ornaments tree to show them off! You'll love the Fitz and Floyd salt and pepper shakers, cookie jars, snack trays, dishes and all the other tableware that celebrates Santa and the Christmas season.